At the annual Panopto conference this year we were introduced to some new features with the 6.0 update. The most exciting being, the new analytics suite. It’s no secret that Panopto’s focus is on massively scaling production of video content. Recorder ease-of-use and searchable libraries have been key to this growth so far. Last year Panopto saw a 150% growth rate in new recordings, topping out at 5 million. Here at Viducon we have seen similar rates with over 40,000 videos produced last year. 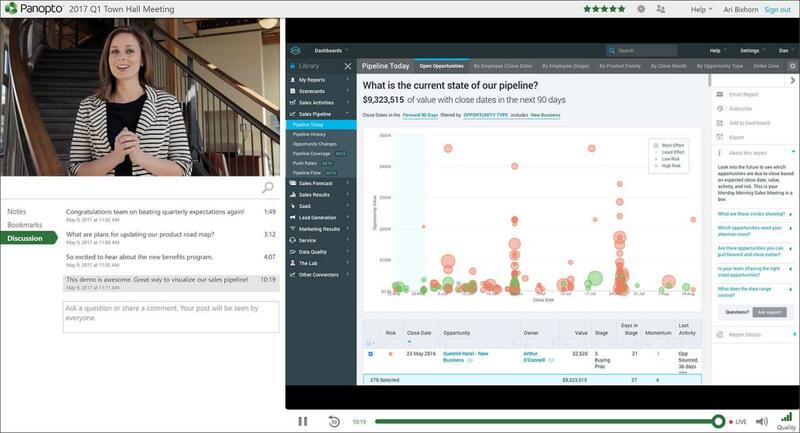 To help users grow their libraries support administrators and content producers will have access to new analytics features that brings viewer trends and audience behavior into focus. Rich visualizations gathered in a new dashboard show more useable and actionable data. The analytics provide insights into the most popular videos as well as those that generate the highest engagement and most discussion. This information can be used to identify the most compelling or confusing topics as well as identifying trends in viewing behavior, including the reach and engagement of live events, as well as the degree of time-shifting among event views. And as with all updates, this number crunching power is available to Panopto admins at no additional cost. If you want to know a bit more about your viewers or would like a walk through the new dashboard please give us a call. Last week at #panopto18, the annual Panopto conference in London we were inspired but also walked away with some accolades. Viducon was awarded as the top reseller in EMEA for most new clients and most client renewals. That means if you’re reading this, THANK YOU. It is your commitment to better education through video that help makes this possible. We’re happy to be on this journey together and look forward to bringing new and better video experiences to you and all of your viewers. Copenhagen Business School (CBS), our customer of 4 years, is using Panopto’s all-in-one video solution for lecture capturing, flipped classroom, blended learning, student assignments and much more. Associate Professor Till Winkler from the Department of Digitalization, who was part of the panel debate at Panopto’s Annual conference in London (2017), was asked how his university uses Panopto and of their experience. In the interview Till Winkler was asked, how Panopto is used at CBS, what are the benefits for teachers and students in using video and how CBS students and stuff reacted to the introduction of Panopto. We at Viducon are of course always happy to hear of our customers positive experience, with the solutions that we offer. There is Much Potential for Video in Higher Education: It’s Worth Trying! If you are interested in trying Panopto, the video solution used for blended learning at CBS, please, contact our team to receive a personalized demo, or sign up for a 30-day free trial. Video has always offered great potential to support and scale your training programs, but traditional video technologies offered only point solutions that would separately record, edit, manage, and share your videos, and that were each complex and expensive to use. Fortunately, there’s a better way now. Modern video platforms (sometimes called video libraries, video content management systems, or simply a “corporate YouTube”) can support video from end to end — offering the ability to capture, edit, manage, search, share, and view video using an integrated suite of tools. And while cost used to prohibit the use of enterprise video technologies outside of the top Fortune 100 companies, today a video platform can be more efficiently sourced, with affordable options for both hosted and on-premises deployments. IBM and Microsoft both reported their investments in video generated triple-digit positive ROIs, each in fewer than 2 years, and both largely due to savings on training costs. Historically this has been a challenge for video, as many video solutions offer only limited ability to search via manually added metadata like titles or tags. And the challenge continued even when an employee actually found a video — with many training videos running 30-60 minutes or longer, the only means to find a relevant 2-minute segment was to hunt-and-peck through the entire timeline. 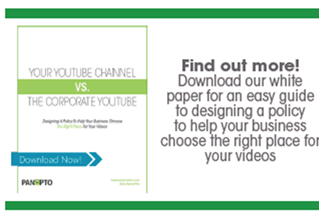 Modern video platforms offer a better option. 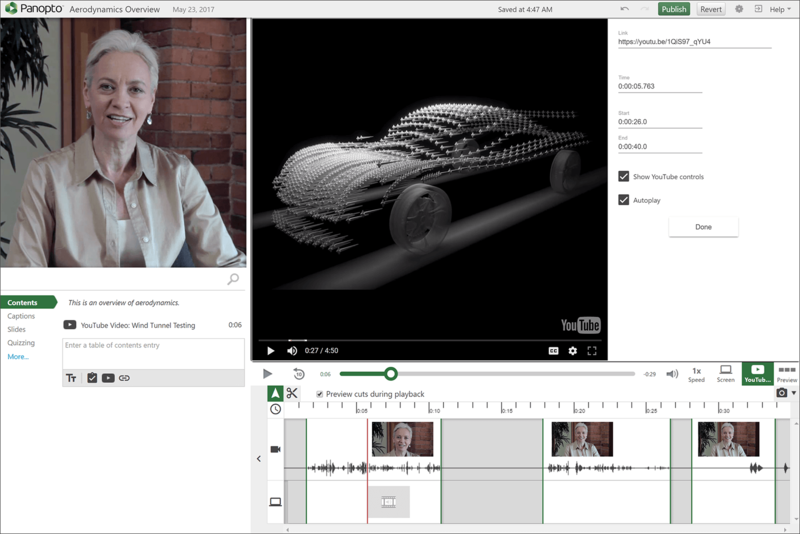 Features like automatic speech recognition (ASR), optical character recognition (OCR), and slide content ingestion enable some video platforms to index a significant amount of the content spoken or shown in your recordings. By nature, training videos will be filled with details and sought out on a regular basis from employees across the organization, so strong video search capabilities are a necessity. Look for a modern platform that allows your team to search across all the videos in your library as well as inside the actual contents of each video. Specifically, the video platform should support indexing the words spoken or appearing on-screen in each video along with more traditional metadata. The single most essential aspect of using video for training is also the most straightforward: you need to be able to record it, quickly, and ideally from anywhere. When it comes to training, video is only as effective as your recording technology allows it to be. 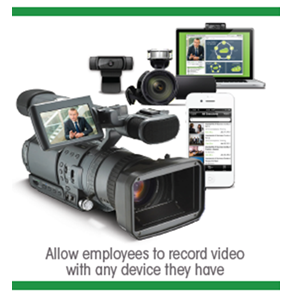 Your video solution should be able to record with whatever camera your team and your employees use, or record their screen, or their mobile device, and do so whenever and wherever the employee chooses. Restricting employees to dedicated recorders or dedicated studio rooms only creates hurdles to adoption and may ultimately limit your success. An ideal video solution should allow your team to capture an unlimited number of video sources, including one or many streams from webcams, camcorders, or other video cameras; video from mobile devices or wearable technologies; and the contents of one or multiple computer screens. The more recording options your system enables, the more ways you’ll find to implement video to scale and support your training programs. Perhaps the single most valuable aspect of using video to support your training efforts is that video enables your team to consume training content anytime, anywhere it fits into their schedules. That is if you let them. As more organizations move to a Bring Your Own Device model, enabling employees to use personal technology to be more productive at work, your video solution must be ready to accommodate a wide variety of devices. A mobile-ready video platform allows employees to view videos on any device regardless of the original recording format. Ideally, your solution should offer native apps that allow users to interact with your video library just as they would from a desktop browser, complete with search, sharing, recording, and upload support along with viewing capabilities. An important part of monitoring the success of a training program is monitoring when, how and how completely employees interact with your video. A modern video platform enables managers and administrators to do just that. As employees log in to watch your content, viewing video analytics gives you valuable insight into what videos are being watched, and whether any given member of the team has completed any particular video. This, in turn, enables your training team to monitor compliance rates, as well as refine and revise your training programs as needed to ensure ongoing success. The foundational technology that enables all the above is so simple it can often be overlooked — a centralized place where your organization can store and access its video content. Too often, for organizations without a video library, that recording is simply saved to a hard drive, a network file share, or a SharePoint site where it’s nearly impossible for others in the company to discover. In those cases, even when the file is found, it can only be played back if the viewer happens to have a device that can play that specific file type. Of equal concern is security. Organizations that lack video content managementoptions may find that employees already comfortable with consumer tools like YouTube or DropBox may be choosing to use these public spaces to share internal content in the name of efficiency. Ensuring your video and file systems are easy to find and easy to use with a mobile device can mitigate many unintentional security lapses. Video helps companies increase the effectiveness of their training, improve the consistency of learning content, scale L&D efforts to a global workforce, enable social knowledge sharing, and of course, lower costs. For corporate learning and development, a video platform is more than a nice-to-have — it’s a necessity. As organizations make video a core part of their L&D efforts, the use cases outlined in this paper offer only a starting point. Training departments, management, and individual employees will discover new scenarios for using video that address the unique needs of their business and provide them with new ways to communicate and share information. Best of all, video is no longer an inaccessible technology locked away in AV team closets and server racks. The widespread availability of inexpensive, high-quality video cameras in laptops, tablets, and smartphones — and the increasing use of video platforms are making it easier for L&D teams to do more with video. Today’s learning and development professionals already understand the potential that video technology offers. Make sure your organization isn’t missing out! If you are interested in trying Panopto, please, contact our team to receive a personalized demo, or sign up for a 30-day free trial. This article was originally published on Panopto’s blog. “I have seen many hours of video with you, [teacher], before I met you in the classroom. – And when I first saw you in class, it felt like meeting a celebrity.” – This was an experience shared by one of the students in the final session of a blended learning course in Strategic IT Management at the Copenhagen Business School (CBS). In this elective course, Associate Professors Till Winkler and Mathias Trier from the Department of Digitalization, used both online lecture videos and workshop-based classroom teaching. We conducted follow-up interviews with their students at the time the course was completed, to find out what students think about blended learning. A year ago, we published a case study on the early experience of professor Winkler in using video as part of his teaching, where he concluded: “it’s worth trying!” At that time, he had started to experiment with video for recording lectures and providing some parts of his course fully online, which allowed the students to learn – and him to fulfill his teaching obligations – irrespective of time and place. Inspired by his early experiences with teaching online, professor Winkler decided for the next edition of this course to apply a truly blended approach. He planned to flip the classroom by providing all required lecture content as videos prior to the class and using classroom time exclusively for case-based workshops that would target at maximizing student interaction. For this blended course, he could reuse the videos from the previous year. The videos were hosted on the university’s video platform, Panopto, and could be easily copied to the new course folder. Each week, the students got access to the relevant videos via the university’s learning management system (LMS). Students were encouraged to watch the videos and complete small online activities such as polls, quizzes, and open-ended questions before each workshop class. While the lecture videos mostly covered conceptual content such as theoretical frameworks and definitions, in the case-based exercises students worked in groups to apply these concepts on a concrete problem of a case company, followed by a presentation to the class. Most of the classes took place in a studio-based learning environment at CBS that facilitates this type of workshop format. What do students think about Blended Learning? In this sense, one key takeaway from our interviews is that teachers need to educate video learners about the possibilities to regulate the speed of the videos and to take individual notes. Notes can be taken directly in the Panopto user interface on the same page as the video player. Students can share individual notes by making them ‘public’, or they can keep them ‘private’. Notes can be edited or deleted and their visibility can be changed at any time. “The combination of having the theory more or less online with video and the practical cases offline – that is a good combination”. For teachers, this means they may need to rethink their ways of facilitating learning at university and find a good split between what can be best provided online and what can be done better in the classroom. As the experiences by CBS professors Winkler and Trier show, one way of making this split is by moving conceptual knowledge into short and concise online videos, while increasing the time for applying this knowledge in the classroom in the form of case-based workshops. However, teachers may need to find their own approach to the blended format depending on their specific subject of expertise as some content may lend itself better to the online medium than other. If you are interested in trying Panopto, the video solution used for blended learning at CBS, please contact our team to receive a personalized demo, or sign up for a 30-day free trial. What’s New in Panopto 5.4? Today, we’re excited to announce the latest release of our video platform. For AV teams and anyone involved in live events, Panopto 5.4 includes some major enhancements to our video broadcasting capabilities. We now support the ability to ingest live feeds from RTMP encoders. We’ve updated our media pipeline and video players so that single- and multi-feed live broadcasts are streamed entirely in HTML5. And we’ve introduced analytics that provide statistics on viewing behavior during live events. As with all releases, we’ve made additional improvements across the platform. In version 5.4, we added a new YouTube integration that makes it easier for you to curate existing videos and insert them into your Panopto recordings. We’ve also added a welcome tour that’ll help your new users get up to speed more quickly. And we’re updating our Android and iOS apps with some handy new features. For AV teams around the world, live encoders are the starting point for successfully streaming an event online. Whether it’s a rack-mount appliance, a portable solid state device, an on-camera wireless device, or a software-based encoder, converting video feeds from cameras into formats suitable for live streaming is essential to any live production workflow. However, for the encoded video to reach a large-scale audience, it requires a streaming server that can distribute it efficiently across corporate WANs or the public internet. Cloud-based streaming platforms like Wowza Streaming Cloud, and in the consumer space, YouTube Live and Facebook Live, provide this scalable video streaming infrastructure. With today’s release of Panopto, we’re excited to provide businesses and universities with a new option for broadcasting video at scale using their existing encoding infrastructure. Starting today, these organizations can connect their RTMP encoders to Panopto’s cloud-based video platform in order to live stream presentations and events to tens of thousands of simultaneous viewers. Teradek’s Vidiu series of portable encoders can transmit wirelessly from cameras to Panopto. As the RTMP feed is ingested, Panopto transcodes it to HTTP Live Streaming (HLS) and transrates it for adaptive bitrate (ABR) delivery. This enables a high-quality video feed to reach audiences at massive scale on desktop and mobile platforms. Panopto’s integrations with content delivery networks (CDNs) and WAN optimization solutions minimize video startup time and buffering. And with live DVR, viewers who join late never have to miss a moment of the webcast. Panopto provides an end-to-end streaming solution from RTMP encoders to HLS endpoints. During the live event, Panopto also records the video content for on-demand playback. When the event wraps up, the on-demand recording becomes instantly available with accompanying metadata such as chapters and thumbnails, which Panopto automatically extracts during the live stream. This eliminates the publishing delays that are common with most live event workflows. 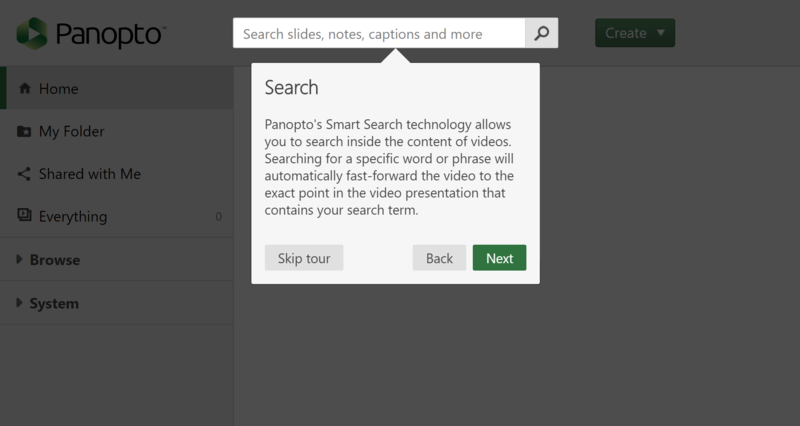 In addition, Panopto’s unique Smart Search technology makes the content of every on-demand recording searchable. Viewers can search for any word spoken or shown on-screen in the recording, and instantly fast-forward to that moment in the video. We’ve also revamped our media pipeline and video players in Panopto 5.4 so that live events are streamed entirely using standards-compliant HTML5 video. This eliminates the need for third-party browser plugins, as many web browsers deprecate support for Flash. The interactive video player provides a unique experience for watching live events. It allows you to watch two synchronized feeds of video in a single web browser window. It provides a more engaging and natural viewing experience for most live events, which often consist of two video feeds—the speaker and their on-screen content. With Panopto, you see the speaker and their content at all times, just as you would if you were sitting in a live audience. There’s no need for picture-in-picture, which degrades the viewing experience by obscuring portions of the on-screen content, and there’s no need to make trade-offs of watching only the speaker or their content. The interactive video player also reduces onsite complexity for the AV team. When viewers can always see both video feeds, there’s less need to perform live feed switching during the event. Panopto’s interactive player is the industry’s first to support multiple, synchronized live feeds using industry-standard HTML5. The player supports adaptive bitrate streaming, variable-speed playback, live DVR capabilities, time-stamped digital notes, and custom branding. Panopto’s interactive video player is the first to support synchronized live HTML5 video feeds in a single browser window. HTML5 broadcasts can also be viewed in Panopto’s embeddable video player. The lightweight player includes automatically generated embed code for easy integration into learning management systems, content management systems, and other web pages. The embed player supports adaptive bitrate streaming, variable speed playback, and custom branding. And on mobile devices, Panopto’s iOS and Android apps enable viewers to watch live events from anywhere on their phones and tablets. During and after a live event, producers, administrators, and event organizers often want to measure the reach of the event and the level of viewer engagement. So in Panopto 5.4, we’ve added the ability to see live statistics on viewership. This includes the aggregate number of views, unique viewers, minutes viewed, and drop-off rates. 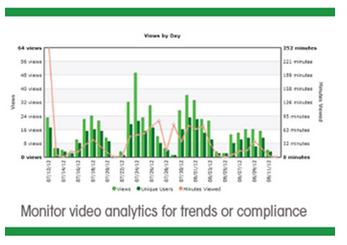 The views by Video Time graph shows late joiners and drop-off rates for a live event. Live analytics also provide insights into viewing behavior at the individual level. Within the analytics dashboard, event creators and administrators can see who participated in the live event and how many minutes they watched. YouTube video integration: You can now insert segments from billions of YouTube videos into your Panopto recordings. From within the Panopto editor, simply specify a point in the video timeline, click on the YouTube icon, and paste the address of the YouTube video. You can specify start and end times to only show segments of a video, set options to show YouTube controls during playback, and specify whether the video should auto-play. Welcome tour for new users: When your new video creators sign in to Panopto for the first time, they’ll be presented with a guided tour that introduces them to product capabilities and accelerates their time to productivity. Mobile app enhancements: With this latest release, Panopto for Android now supports offline video playback, enabling viewers to download video files directly to their device for later viewing on-demand. And Panopto for iOS now supports background upload for video files, making it even easier to use your iPhone to capture and share video. If you’re interested to find out more about what’s new in Panopto 5.4 or about how our video platform can help your organization manage and stream video more efficiently, contact our team for a demo today. Three institutes (MEF*, DANSK** and TORS***) of the Faculty of Humanities at Copenhagen University, will start using Panopto from the fall semester 2017 for lecture capturing, flipped classrooms and blended learning. Guy Geffen, one of the representatives of the project at TORS (Department of Multicultural and Regional Studies), explains that the goal of the project is to be more “up to date” when it comes to teaching methods. Therefore, according to him, modern teaching methods such as flipped classroom, blended learning and lecture capture, should be obvious part of teaching these days. One of the major user cases for the use of video, is recorded lectures, where it is expected that lecture recordings could potentially assist students to better perform in their exams, by giving them the possibility to reflect on material learned during the long semester. Lecturers who joined the project, sincerely believe, that video is a good additional tool for assisting the students and by that better their learning process – they can review the lectures at their own pace and time, according to their individual needs. Mr. Geffen, who teaches language at the University of Copenhagen, believes that “language learning is learning by doing”. However, according to him, they are facing an issue at the university, where they only have approx. 8 hours per week, for the different language studies at TORS. This makes it very difficult for those students who are enrolled in language studies, to achieve optimal learning and perform well at the exams. As part of the project, teachers will be able to apply flipped classrooms and blended learning methods by using Panopto’s video solution. These methods will hopefully free more time from the 8 teaching hours available, for more hands-on and learning by doing, as mentioned by Mr. Geffen. „We believe flipped classroom will give us the extra time needed for teaching in the classroom“. Students can watch the video at their convenience, by that giving more time for exercising and training in the classroom together with the teacher. As for lecture recordings, Mr. Geffen also mentions the additional service, which this provides to the international students, helping and giving them more flexibility in their studies at the University of Copenhagen. There are several other ideas of how to use Panopto’s video solution, where one of them is to have students produce their own videos – f. ex. submitting their assignments or presentations in video format by using Panopto’s mobile app and recording software (PC or Mac), which makes the handing-in of video assignment, a straightforward process. Participants of the project are highly excited about trying these new methods of teaching, using a video solution which can cover for many of those user cases. The project will officially take place from June 2017 to January 2018, with the goal of evaluating those new teaching methods and Panopto’s video solution. If you are interested in trying out Panopto video solution at your organization, please, contact our team for a personalized demo or sign up for a 30-days free trial. Viducon participated at the Digital Learning Networking Conference, hosted by SmartLearning, in Aarhus on the 18th of May, 2017. SmartLearning which organized the event, is a unit of Copenhagen Business Academy (Cphbusiness), which supports educators in their efforts to digitalize their teaching, by using learning technologies. This was the second annual conference organized by SmartLearning, which took place at Business Academy Aarhus (Erhvervsakademi Aarhus), where around 160 participants had attended. The purpose of the conference was to help teachers and educators from Denmark, to better understand the benefits, which digital learning can bring to the organization, and the role of learning technologies in future education. At the conference a few examples of best digital learning practices were introduced, educators had a chance to meet with leaders of Danish educational institutions, and network with colleagues from different institutions, who are also interested in this highly interesting field. During the conference, the future challenges in education were introduced, where the issue of uncertainty, of what would be relevant to teach in future studies, was brought up and discussed. The speakers presented how educators though, could adjust to these new circumstances by applying new teaching methods and using tools already available, in a variety of learning technologies, such as educational videos. Panopto, which was one of the main sponsors of the event, had a stand together with its Danish business partner, Viducon, where participants could talk with representatives of both companies and receive some info about Panopto’s world leading video solution. At the stand participants could get some inspiration from the many user cases, applied at universities and colleagues around the world who are using Panopto, such as Copenhagen Business School (CBS), Cphbusiness, Yale and Oxford. Especially for the occasion Viducon created an online voting system, where all can nominate the Video Educator of 2017, be it from the educational or businesses sectors. Viducon would like to praise the educators for their extra effort, and therefore would need your assistance in nominating and voting. Copenhagen Business Academy (Cphbusiness) is a leader among colleges and universities in Denmark, when it comes to using video as part of teaching. How they use and experiment with video, is quite different from the more traditional lecture capture. Therefore, it was interesting to understand their unique approach to the use of video and their implementation process. In the article, we will be looking at Cphbusiness’ use of video, where Carsten Storgaard and Simon Hartmann from the Pedagogical IT department, talk about the creativity of the teachers and students, when using Panopto’s video solution. According to Carsten and Simon, their department wanted to generate some interest in digitalisation and enhance the digital learning experience. Last spring (2016) the college initiated 24 different projects, where teachers and or teams of teachers experimented with different projects, making wikis, videos, flipping their classrooms, etc., where they described, a lot of those experiments involved the use of video. As Carsten further explains, “an easy way to get people on board is, of course, if you can find a tool that is easy to use and that can support what they do in their daily life”. According to him, the initial idea from the technical perspective, was “to find a way of how to deliver PowerPoint presentations in a different format, such as using video”. That was the reason, why they at first found Panopto to be the solution which could serve their needs. Teachers could easily make their own video presentations at their own time and pace, without necessarily coming to the studio. From the beginning, the approach was very experimental, where the teachers were told, “We give you a tool (Panopto), I just show you how it works, and you figure it out what you want to use it for, and how you want to use it as part of your teaching”. This which was most interesting, was that teachers were not pushed into a frame of how they are supposed to use video, they were free to use and experiment with Panopto, this somehow made teachers develop their own ideas of how to use it. “We do NOT preach: “You should use Panopto like this; you should capture your lectures like this. The setup should be like this”, – Carsten says. Simon also believes that the main advantage of this approach, are the many different and exciting user scenarios, which emerge. Simon describes this phenomenon as “a ripple effect” that has driven demand: “It was the teachers themselves who wanted to challenge the idea of what they can use it for, and the Pedagogical IT department did not need to be pushy”. He distinguishes, between a ‘natural ripple effect’, where teachers who have experimented with clever ways of using Panopto, inspire their co-workers to adopt their way of working with video. Another ripple effect form, is the more ‘forced or extended ripple effect’, where people like themselves (Carsten and Simon), who get to move throughout the entire organization, have a unique opportunity to showcase great user cases at other campuses, thus extending the ripples. Furthermore, Cphbusiness even experienced an even more interesting phenomenon, where the production of video, which first was intended as the teacher’s “job”, is now moving from the teacher to the students, e.g. students’ assignments are being handed in using video, which is made possible, using Panopto’s student assignments feature. The teachers always wanted the students to be more engaged, and they were surprised with how easily the new video tool made this possible, both from the technical perspective but also because the students thought it was fun. Cphbusiness has plenty of different user scenarios, which have great potential to provoke and inspire other schools, colleges and universities. Videos are being used in a more experimental way by the teachers, who use their creativity in finding new ways of using Panopto and by that video. From what Carsten and Simon observed, both teachers and students enjoy this experimental approach and they do not need to push the teachers to make any videos. Their recommendation is for schools to have their own ambassadors who tell their success stories to other teachers, causing the ripple effect. But it is also important to give teachers enough time and technical support when needed, and of course the right video tool, which is easy to use for everyone. About Cphbusiness: founded in 2009, it is the largest business academy in Denmark with 5800 full-time and 7200 part-time students. 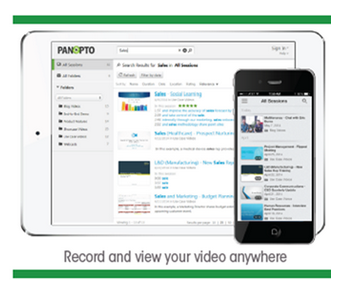 If you are interested in trying out Panopto’s video solution at your organization, please, contact our team for a personalized demo or sign up for a 30-days free trial.